Poster extolling the founding of the Provisional Government of the Republic of China (PGROC) in Beijing in 1937. This poster was almost certainly produced to coincide with the founding of the PGROC in December 1937. The visual trope of the rising sun and city gates of Beijing emitting light are clearly reminiscent of Manchukuo propaganda. Note also the references to a tattered Chinese Nationalist Party (KMT) flag, with its “white sun” emblem. The replacement of this flag with the “five coloured flag ” (wuseqi), which was revived by the PGROC in 1937, was indicative of a general approach under this administration to discredit Nationalist ideologies in favour of more conservative, Confucian ideas. 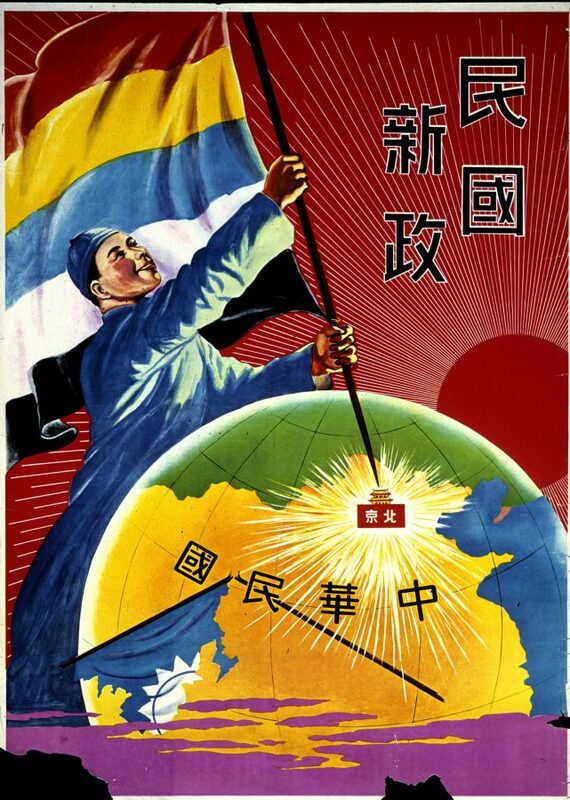 Note also the rather ambitious designs that this regime had on the rest of China (the man is planting his flag on China as a whole, rather than the patchwork of territory in north China over which the PGROC actually ruled).